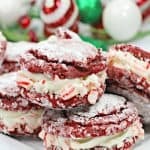 Take your holiday baking game to the next level with these refreshing and delicious Candy Cane Cookie Sandwiches. Using a standing mixer, beat together until smooth the butter, sugar, and brown sugar. Beat in one egg at a time until combined. Beat in the vanilla, vinegar and red food coloring until combined. In a large bowl, combine the flour, cocoa powder, baking powder, baking soda, and salt and whisk to combine. Gradually beat in the dry ingredients into the wet until combined and a soft dough forms. Line a cookie sheet with parchment paper. Using a small ice cream scooper, scoop out mounds of dough onto the cookie sheet about 2 inches apart. Place into the fridge for 1 hour. Once all cookies are baked, dust with powdered sugar. Scoop frosting into the piping bag. Pipe a large dollop in the middle of the of the bottom cookie. Carefully push the top cookie onto the frosting and push down so that the frosting can peep out the sides. Sprinkle the crushed candy canes onto a plate and roll the edges of the cookie into the candy canes.